We’ve all done it… In our eagerness to get set up and catch a whacker we end up breaking a vital piece of tackle, having to cobble it back together with gaffa tape. My Nemesis is landing net spreader blocks, or at least it was until these bad boys from Top Notch tackle became available. 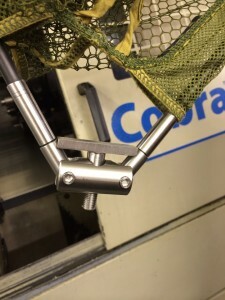 Made from Quality 3 stainless steel they can be made to suit any landing net (within reason) and because of their robust design and quality craftsmanship they will last you a lifetime. There is even a recess for all you tackle tarts to put an isotope to aid night netting and with a simple push of the central assembly the net breaks down. At £35 plus P&P they do seem a lot of money but quality always comes at a price and trust me this and all the products from Top Notch Tackle truly are well worth the initial outlay as they will never let you down, plus they look the business too. Another small but vital piece of kit that always takes a beating on the bank is the humble bivvy peg. They bend and break relatively easily, especially if you are one of the blessed “mallet brigade”. Top Notch Tackle have created two different sets of quality stainless steel bivvy pegs. 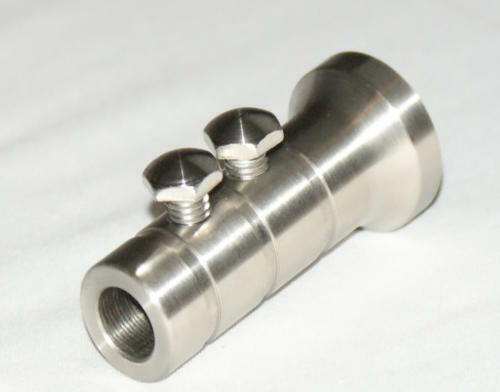 These are made from 7mm stainless steel with an 18mm top piece also made from top quality stainless steel. The tee pieces in these pegs are removable. These are sold as a set of 10 or 8. 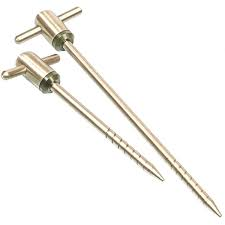 They come in two different lengths depending upon your preference 5” (Stumpy) or 8” (Lofty) and will take all sorts of punishment without so much as a dent in them. Again they are a little bit more expensive than your average run of the mill pegs but you will never have to buy another set again. Finally the Top Notch Tackle stage stand range is both impressive and comprehensive. All turned from solid Stainless steel the range covers all your needs whilst fishing from platforms and has many different inserts available to cover all types and sizes of banksticks, including chunky as well as solar travel lite 3/8ths sticks. There is also bivvy peg stage stands to compliment the Stumpy and Lofty bivvy peg ranges, enabling you to bivvy up on the stages should you need to do so, coming in sets of 2 stand and 4 pegs. All available in Natural and Black anodised aluminium. To order simply contact Dave Woods via email omegadave1962@yahoo.co.uk or go to their Ebay shop. 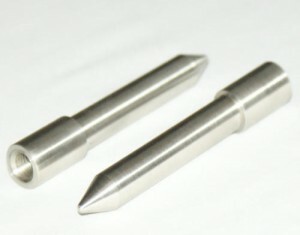 To have a look at their full range of products go to their website at www.top-notchtackle.co.uk or go to their facebook page. Top-Notch Tackle is a business which was born from the needs of the hobby that I love, which is fishing. It has enabled me to share my designs with other anglers and through trial and error we have been able to produce a range that is both stunning in design and durable through high use. This family run small company aim to carry on producing this uncompromisingly high quality work whilst adding new ideas as we continue to grow.